The United Arab Emirates are holding elections on 24 September for the federation's parliament, the Federal National Council. These are only the second elections since independence in 1971, the last being in 2006. Government supporters have dubbed this a major step in the country's gradual progress towards representative government, but opponents see it as a sop to democratic sentiment and aspirations that will do little to loosen the grip of the ruling royal families. What is the Federal National Council? The Council has 40 members, only half of whom are elected. The rest are appointed. It has little power beyond offering advice to the Federal Supreme Council, which consists of the rulers of the federation's seven constituent states. The Emirates' electoral system is far from representative democracy. Voters are chosen by the authorities on a quota system based on historic tribes and the size of the constituent states. The number of voters has been vastly expanded since the 2006 elections, when only 6,000 people were eligible. This time 129,274 citizens can vote, drawn from the roughly 300,000 citizens over 25 who are notionally eligible to vote. Emiratis make up less than 20 per cent of the population of about five million, with the rest being foreign workers - in particular from India. Expatriates sustain an economy that provides Emiratis with a generous welfare state and government jobs. This in turn tempers many complaints about lack of democracy. There are 463 candidates competing for 20 seats. Five candidates in Sharjah stood down for "personal reasons" earlier in September. 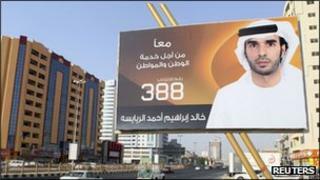 All candidates are native-born Emiratis, drawn from the list of chosen voters. All candidates are independents, as no political parties are allowed. How free is the electoral environment? Campaign material is practical and uncontroversial, with candidates typically pledging to do more to develop infrastructure and improve living conditions. Candidates generally endorse the government's strategy of increasing the role of native Emiratis in the economy through training and education. There has been some call for further political reform on the campaign trail, and academics have debated the question in the press. But officials have warned candidates against promising too much, given the limited powers of the Council, and there has been no direct criticism of the role of the ruling royal families. This is not surprising, as the authorities usually tolerate little open criticism of the constitutional system. Five pro-democracy campaigners were arrested in April on charges of anti-state activity for doing no more than signing an online petition in support of more representative government. What form does campaigning take? Candidates are running adverts on television, radio and billboards and in local and national newspapers. Half of the top ten candidates running adverts, including the top four, are standing in Abu Dhabi, suggesting a particularly hard-fought race there. News conferences are rare, but many candidates set up "election tents" in their constituencies where voters can come and speak to them. It is significant that many candidates are making extensive use of social media like Facebook, Twitter and Youtube, as well as SMS, to get their message across. One candidate has 50,000 followers on Twitter, according to the National Election Committee. What about the role of women? The Emirates authorities frequently promote their record on empowering women, especially in comparison with their status in other Arab countries. Women make up 46% of the hand-picked electoral college, and 85 of the 468 candidates are female. At the last Federal National Council elections in 2006 only one woman was elected out of the 63 who stood, and a further eight were appointed by the royal rulers. The chairman of the National Election Committee, Anwar Muhammad Qarqash, has said the government wants to boost the role of Emirati women as they make up 59% of the civil service and hold four ministerial posts in the federal government. Some women candidates have addressed female voters directly in their campaign material, saying that they alone can represent women's interests. One candidate, Khulud Ibrahim, recently told a women's meeting in Dubai that this had prompted male candidates to "take women seriously and try hard to get their vote". With an eye on the role of young people in propelling protests in nearby Bahrain and other Arab countries, the Emirates authorities have highlighted the proportion of young candidates standing in the Council elections. Thirty-five per cent of the candidates are under 30, even though candidates must be over 25.